The Dramatica Theory of Story is a model of the mind’s problem solving processes which has been successfully employed for seventeen years in the analysis and construction of fictional stories ranging from major Hollywood productions to novels, stage plays and television programs. Software based on the Dramatica Theory is built around an interactive Story Engine which implements the problem-solving model as a method of determining the meaning and impact of data sets and of predicting motivations and actions based on potentials inherent in the data. This is achieved by creating a Storyform – essentially, a schematic of the problem solving processes at work, their interactions, their outcomes, and the future course they will take. The Dramatica system and its problem-solving algorithms can be applied with equal success to the analysis of real-world situations as well, specifically in determining the motivations behind the actions of a target group and in the prediction of their future actions and potentials for action. To illustrate this methodology we let us consider a generic target group. This might be a clique, club, movement, political faction, tribe or nation. Which brings us to the first benefit of this system: Dramatica is scalable. That is to say that it works equally well on individuals or groups of any size. This kind of scalability is described by a Dramatica concept referred to as the Story Mind. In fiction, characters are not only individuals but come to interact in stories as if they are aspects of a larger, overall mind set belonging to the structure of the story itself. So, for example, one character may emerge in group actions and discussions as the voice of reason while another becomes defined as the heart of the group and is driven primarily by passion. Stories reflect the way people react and behave in the real world, and so we find that when individuals band together as a larger unit, they fall into roles so that the unit itself takes on an identity with its own personality and its own psychology, almost as if it were an individual itself, in essence, a Story Mind. Similarly, if several groups become bound as when a number of factions join as members of a larger movement, the movement begins to take on an identity and the factions fall into roles representing aspects of our own problem solving processes. Like nested dolls, Dramatica can move up and down the scale of magnitude from the individual to the national or even international level and its ability to analyze and predict based on its underlying model is equally effective. This phenomenon is referred to the Fractal Storyform. In actual practice, many groups of interest are ill-defined, have blurry edges and indistinct leadership. Still, the core motivations of the target group can be determined, and from this the edges of the group can be refined sufficiently to create a storyform of the appropriate magnitude to the task at hand. Dramatica makes a key distinction between the underlying structure of a story and the subject matter that is explored by that structure. For example, every story has a goal but the specific nature of the goal is different from story to story. Elements such as a goal which are common to every story and, hence, every problem solving process, are referred to as Story Points. Similarly any culture, ethnic group, religion, political movement, or faction will employ the same underlying story points but will clothe them in unique subject matter in order to define the organization as being distinct and to provide a sense of identity to its members. Once a story point has been generally accepted in a specific subject matter form it becomes a cultural meme. Efforts to analyze and predict a culture based on memes alone have largely been unsuccessful. Dramatica’s system of analysis is able to strip away the subject matter from cultural memes to reveal the underlying story points and thereby determine the specific storyform that describes that group’s story mind. Essentially, Dramatica is able to distill critical story points from raw data and assemble them into map of the target group’s motivations and intentions. One of Dramatica’s greatest strengths is that it works equally well in constructing stories as in analyzing them. We refer to analysis as the Passive mode and construction as the Active mode. When dealing with a target group of interest, this translates into the ability to not only passively understand and anticipate the group, but also to actively create courses of action by which to intervene in and/or influence the group’s future activities and attitudes. To understand, we determine motivations and purposes. To anticipate, we project actions and intent. To intervene, we define leverage points for targeted action. To influence, we determine nexus points for focused pressure. Let us look more deeply into the methods employed in the Passive mode, then return to do the same for the Active mode. The passive mode is comprised of Analysis and Prediction. Analysis is achieved by first identifying independent story points and then determining which ones belong together in a single storyform. As described earlier, story points can be derived from cultural memes, but are also evident in the target group’s communications (both for internal and external consumption), in new publications and vehicles of propaganda, in works of art (both authorized and spontaneous), in popular music and entertainment, in the allocation of resources, in the movements and gatherings of individuals – in short, any data can directly or indirectly provide valid story points. Once a collection of story points has been assembled, it must be determined which ones belong together in the same storyform. Each storyform represents a different state of mind, but there may be many states of mind in a single target group. These are not different mind sets of individuals, but different mind sets of the group itself or, put in a different way, just as stories often have subplots or multiple stories in the same novel, for example, target groups may have a number of different agendas, each with its own personality traits and outlook. This can be illustrated with an example from everyday life where a single individual may respond as a banker at his job, a father and husband at home, a teammate in a league and a son when he visits his own parents. So too, a target group may have one storyform that best describes its relationship to its allies and another that describes its relationship to its enemies. Crucial to this aspect of the process is to determine which storyform is to be analyzed so that the proper story points can be selected as a subset of all those that were derived. The Story Engine at the heart of the Dramatica software cross references the impact and influence of different kinds of story points upon one another, both individually and in groups. As a result, once the scope of the storyform is outlined, the software can actually determine additional story points within that closed system that had not been directly observed as part of the original data set. Some story points are more influential than others, but the bottom line is that Dramatica is able to create a far more detailed and complete picture of the situation under study than is evident from sparse data by itself. Unique to Dramatica’s software, the Story Engine is able to determine the kinds of events that must transpire and the order in which they will likely occur, based on the static picture of the situation provided by the complete storyform. In stories, the order in which events occur determines their meaning. For example, a slap followed by a scream would have a different meaning that a scream followed by a slap. Similarly, if one understands the potentials at work in a storyform derived from story points pertaining to the target group, the Story Engine is capable of predicting what kinds of events will likely follow and in what order they will likely occur. Conversely, if the originally observed data set includes sequential information, such as a timeline of a person’s travels or of the evolution of a sponsored program, the Story Engine can convert that temporal data into a fixed storyform that will indicate the motivations and purposes of the group that led them to engage in that sequence of events. As described, the Dramatica theory and Story Engine (when properly used by experts) is able to translate the spatial layout of a situation into a temporal prediction of how things will unfold from that point forward. In Dramatica storyforms, events are broken into Signposts and Journeys, just as one might look at a road and consider both the milestones and the progress being made along the path. In stories, this data is represented in Acts, Sequences, and Scenes. Each of these is a different magnitude of time. Acts are the largest segments of a story, sequences one magnitude smaller, and scenes are even smaller dramatic movements. As a loose visualization, one might think of story events as not being driven by simple cause and effect, but rather being wheels within wheels, in which sometimes a character may act in ways against it’s own best interest (for example) because of larger forces that have been brought to bear and carry greater weight. In fact, it is the outside pressures that are brought to bear on the target group that build up these potentials as if one were winding a clock. In stories, this creates potentials that make each wheel (such as an act of a scene) operate as if it were a dramatic circuit. In fact, each story point within a given dramatic circuit is assigned a function as a Potential, Resistance, Current, or Power. Determining which of these functions is associated with each story point is essential to accurately predicting the nature and order of a target group’s future activities based on an understanding of the different magnitudes of motivation at work. Storyforms are closed systems. As such, they are flash photographs of a moment in time – a snap shot of the mindset of a target group. But every group, just as an individual or a character in a story, is constantly influenced by outside events, new information, and the impact of others. To the ordered world of a storyform, such outside interference is chaotic. The accuracy of a storyform analysis and its predictions, therefore, has a short shelf-life. The more volatile the environment in which the target group operates, the more quickly the accuracy of the storyform degrades. Fortunately, storyforms can quickly incorporate new data and changes in older data and update literally in real time to give a constantly refreshed accuracy to the analysis. In addition, just because a target group’s motivations and agenda is continually being altered by outside events does not mean the effects upon it are completely chaotic. While some influences, such as an earthquake or an unexpected death or a surprise attack are truly chaotic, other influences only appear to be chaotic because they are not part of the closed storyform. Rather, they are part of a larger story. Applying the concept of the fractal storyform, it is possible to create additional storyforms of both larger and smaller magnitudes to surround the target group so that it is seen not only in and of itself, but as a player in a larger story and also in terms of individual players within it. In this manner many events which previously appeared chaotic can be predicted and the accuracy of the target group storyform is enhanced. Another method for minimizing inaccuracy in prediction is to create a series of storyforms of the target group over a given period. These are then assembled in sequence like frames in a movie to determine the arc of change over time. Truly chaotic events will largely cancel out, but ongoing influence from larger and smaller storyforms with their own individual agendas will create a predictable curve to the manner in which the target group’s storyform is changing, thereby allowing us to anticipate not only what the target group might do on its own, but what it is likely to do as the situation in which it operates continues to evolve. Again, this method allows for real-time updates so that the most accurate prediction of the likely motivations and actions of the target group can be both anticipated and acted upon. Turning our attention from Passive methods to Active methods, we consider altering the actions and attitudes of a target group by either direct intervention or indirect influence. Once a storyform has been created and analysis and prediction have been employed, an assessment must be made to determine if the target group is currently of a mindset contrary to our interests and/or if it will be in the future. Before a response can be developed, the specific nature of the problem must be fully defined. Again, the storyform and its component story points offer an accurate mechanism for determining the specific nature of the problem – the story point or story point arrangements that are in conflict with our interests. Some solutions simply require the alteration of a single story point to a different orientation within the storyform (corresponding to a slight shift in attitude, motivation, or actions by the target group). Often, once the specific nature of the problem is understood, a direct surgical impact on that point may alter it by direct force alone. Still, this is not certain and (especially in more complex problems that require replacing the current storyform with a completely different one) a single small ill-advised move can do far more damage that the original problem and perhaps in ways not anticipated. Fortunately, Dramatica’s Story Engine allows for altering one or more story points in a storyform to see what kind of new storyform will be created as a result. In fact, a large number of alternatives exist by simply altering a few story points. This results in the ability to game out “what if” scenarios in real time to determine a wide variety of alternatives that would accomplish the same end. By comparing the effectiveness, ramifications, and altered projected timelines of each alternative storyform solution, it is possible to create an effective risk analysis of each available option to ensure maximum impact at minimum risk. In fact, alternative storyforms can indicate not only the kinds of risks involved in each potential response to the problem, but also their extent, their magnitude, and their likelihoods. Often, direction intervention is inadvisable for any number of reasons. Further, if the problem with the target group is its overall attitude, the strength of its motivation, or its unity of purpose, any overt action might prove ineffective or even counter-productive, resulting in a response opposite to that intended. In such cases, it may be more prudent to exert a gradual influence or series of influences all at once or, alternatively, put into play over and extended time for a less obviously directly influence. Here again, Dramatica is able to provide tools to know when, and for how long to apply specific kinds of visible and/or unobserved influence to ultimately obtain the desired changes in the target group’s mind set. Again, the first step is to create a storyform from available data and then determine the qualities of the target group’s story mind that are contrary to desired attributes. At times, there may currently be no problem, but the storyform may reveal that, if left unaltered, the course of events will lead the target group into an undesired orientation. This allows for the allocation of our own resources in advance so that we might prevent the Target group from taking that particular course and opting instead for one more consistent with our interests. Once the problem qualities and/or directions have been defined, alternative storyforms can be created using “what if” scenarios and risk analysis to determine the best choice for a new storyform we would like to see in place. This may simply be a new state of mind for the target group as a unit and/or a different path that will take it through an alternative series of actions than it would otherwise instigated. One method of manipulating a target group into a new outlook or attitude is through the subtle placement of the psychological equivalent of shaped charges. Rather that the direct impact of intervention, a number of small, seemingly unconnected exposures to information or manipulated environments can combine to create a single and powerful influence that will provide an immediate course correction to the undesired qualities and directions of the target group. To affect such a subtle and undetectable influence is possible due to the depth and detail of the Story Engine’s ability to calculate the collective influence of many small magnitude story points on the overall storyform. Returning to the “movie frame” concept in a proactive, rather than analytical manner, it is possible to create a series of storyforms, each of which is slightly different that the previous one. As with individuals, the mind of a target group is more open to accepting small changes and establishing a new normal that to larger immediate changes which raise resistance. Over time, subtle influences can follow a planned arc of change that leads the target to a new mindset, perhaps even diametrically opposed to its original viewpoint, that would be impossible to achieve immediately, even with the most powerful influences brought to bear. It is important to recognize that due to the effects of chaotic influences (as described earlier) any long-term arc must be constantly updated and adjusted so that new influences are brought to bear to limit or leverage the impact of chaos on the chosen alternative course toward a more desirable storyform for the target group. 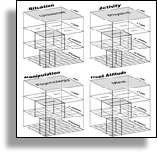 Currently, the story engine requires manual operators versed in the Dramatica theory for processing and creating storyforms for purposes of Analysis, Prediction, Intervention, and Influence. In the future, natural language processing can be coupled with the story engine’s operations to bring a degree of automation to the identification of story points using hub theory to locate them in large quantities of raw data. Influence networks can be employed to determine which story points are likely to belong to the same storyform and to assemble them into alternative storyforms which may co-exist in the same raw data. Employing Dramatica’s real-time Story Engine (in operation since 1991, but not included in the commercially available version of the software) can allow for real time analysis of ongoing data flow and indicate new storyforms as soon as they manifest in the mindsets of target groups and alert operators when existing storyforms have dissolved or altered due to ongoing influences. Natural language output can provide continuously updated options in time-crucial situations with a series of live “what if” scenario suggestions. The Dramatica Theory of Story and the software that implements the theory in an interactive story engine has, for the last seventeen years, successfully enabled accurate analysis and creation of story structures in motion pictures, novels, stage plays, and all forms of narrative communication. By identifying the crucial story points in the mind sets of target groups of any size, the story engine is equally effective in analyzing and altering the target groups’ current and future attitudes and behavior in the real world.